Church leaders successfully persuaded California Pacific Medical Center to delay a weekend traffic closure on Van Ness Avenue so a temporary ban on street parking would not coincide with Easter weekend. 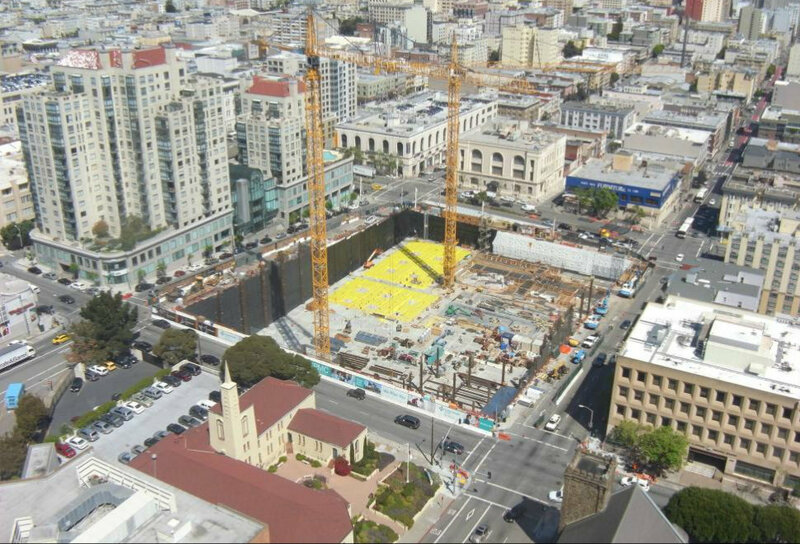 One block of Van Ness, between Post and Geary Streets, will be closed to car traffic this weekend so crews can construct a pedestrian tunnel connecting CPMC’s hospital with its medical office building, under construction at Van Ness and Geary Street. The detour, one in a series of lane closures on Van Ness, was originally supposed to happen last weekend. Now that it’s been postponed, the two full traffic closures will coincide with the annual Cherry Blossom Festival and parade, which runs north on Polk Street, then west on Post Street. To accommodate the extra traffic on the detour route, street parking will be banned for the weekend on Gough and Franklin Streets, which run parallel to Van Ness. Leaders at several nearby churches were irked when they discovered that those parking restrictions would take place on Easter weekend. Three weeks before the planned Easter closure, a religious community leader contacted the SFMTA and threatened a public “message of condemnation” of the agency if it wasn’t moved, according to emails obtained through a public records request [PDF]. Farrell’s office also contacted HerreroBoldt. In a March 12 email response, HerreroBoldt spokesperson Miquel Penn explained that Easter weekend was chosen because it has low traffic volumes, “straddles local schools’ spring break,” and doesn’t include any major traffic-generating events. He said delaying the construction “would jeopardize the overall schedule” for the CPMC project. When we asked how HerreroBoldt and CPMC were convinced to move the date, Penn evaded the question. “What drove it was just coordinating with SFMTA, Caltrans, and the Cherry Blossom Festival, and collectively we were able to move the date without adversely affecting the schedule,” he said. According HerreroBoldt, the original dates for the closure were given to them by the SFMTA which took into consideration a number of determining factors of events going on in the City that only the SFMTA and not the construction company would be privy to. This wouldn’t be the first time the SFMTA has conceded to church leaders’ demands to maintain free parking. Like the SFMTA’s previous failure to extend an invitation to a single congregation leader to sit at the stakeholder’s table when conceiving its policy to institute Sunday meter parking, a policy it commenced on the sacred Christian feast day of Epiphany, adding insult to injury, the present attempt confirms that the SFMTA has once again failed in its civic obligation to undertake due diligence in consulting and considering those most directly impacted by its policies and actions. Yeesh. Heaven forbid the City stand up to Ayatollah Pappas. This weekend is going to be a mess. 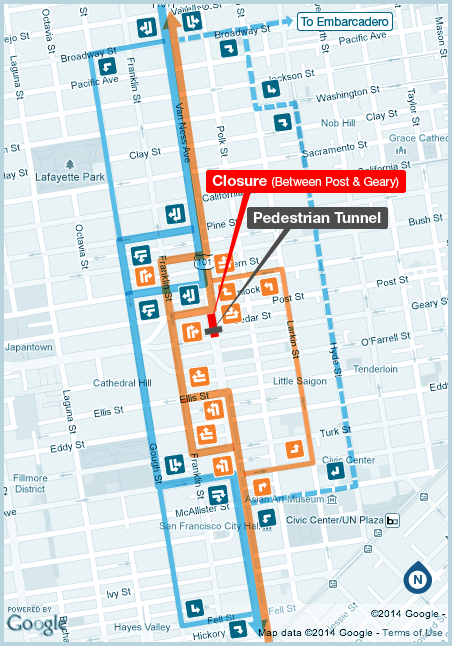 I’m curious if Muni will have enough buses to handle this construction, as well as the Cherry Blossom Festival (the parade is next week) and the N-Judah construction. Michael Pappas, the Executive Director of the Interfaith Council, is also a former investment banker who was defrocked by the church for having an extramarital affair with other men and women. The city should not be giving into the wishes of a bully with no morals. No matter when the Street Closure occurs some constituency is going to be disadvantaged. Just Wait until this Edifice is Up and Running. You think Van Ness is Impossible TODAY .. Just Wait. San Francisco is rapidly becoming a Dystopian view of the Future. Why say “conceded to church leaders demands?” Why not say instead “accomodated neighbors concerns?” Your bias is showing. Agreed. While religious institution concessions can be frustrating, I’d say this one is reasonable. Easter and Passover are moveable feasts and likely didn’t register for construction schedulers. Assuming these houses of worship actually see an influx of Christmas/Easter-only Christians (or those celebrating Passover), holding off a week to avoid the atypical church traffic seems fine. Unfortunate that the Cherry Blossom Festival gets the brunt now. That said, the strength of the language used by the Interfaith Council is fairly obnoxious. Dystopian view of the Future??? That justs sounds ridiculous. Probably because the Church leaders didn’t communicate “concerns” they communicated “demands” backed up with “threats”. When someone is literally threatening you, its not accommodating concerns anymore. Hi. voltairemistress. Take a walk through the Tenderloin.Ride the Muni. Last week it was reported that San Francisco has the BIGGEST disparity in the USA of any large City between Rich and Poor. If that is not Dystopia…And VanNess is simply the transit Dystopian thoroughfare of The City. Gross. In other news, atheists are shown to be more intelligent. once again, the loud few get their way. How is that different of certain race-based advocacy groups threatening to pull the “racist!” card is some specific petty demand is not met, sometimes over things as insignificant as the artwork to be put on a BART new station? When will SFMTA start writing ticket to illegal Church parking? It is ridiculous how SFMTA allow them to take over traffic lane for they own use. Will no one rid us of this troublesome (former) priest? It probably isn’t, but I didn’t read that story, nor comment on it. I’m certainly not claiming otherwise, but without knowing the full context, I can’t comment. You seem to believe I am guilty of some bias here, but I do not think so. Thanks for shining light on this, Aaron. It’s an interesting issue and it seems good that a compromise was reached. I certainly don’t want to offend anyone’s religious beliefs, but while reading this article I couldn’t help but think, what would Jesus drive?